I’m starting to get a little spare tire around the waist and I wanted to start deflating before it got out of hand. In order to set a weight goal, I used the Body Mass Index (BMI). My scale tells me what my BMI is, but initially I didn’t know what to aim for. The National Heart Lung and Blood Institute has a calculator and a lot of great information, but after learning that a BMI of 20 to 24.9 was ideal, I had to guess to find the weights that would result in that range of BMIs. 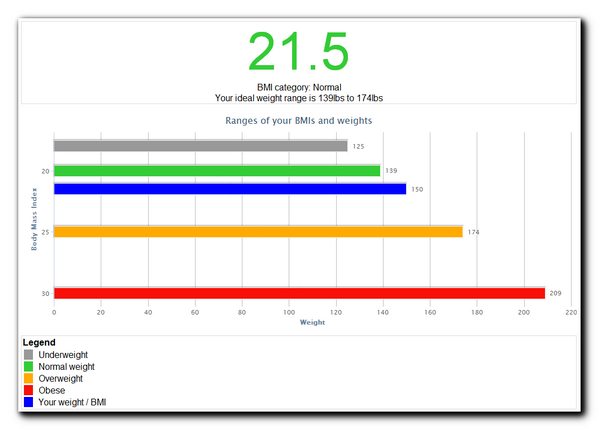 In order to make it easier for myself and others, I created this BMI calculator where you still enter your height and weight, but the chart shows the body weights at the threshold of where you’d be considered underweight, normal, overweight or obese. In other words, aim to stay between the weights of the green and orange bars. The average adult gains 1-3 lbs a year and that’s one trend I’d like to buck. It’s easy to see how it happens, especially as you get busy with kids and work at a sedentary desk job. I’m also not a fan of dieting because a high percentage of dieters gain the weight back, and frequent fluctuations of your weight is unhealthy. I prefer small changes I can commit to for life, like eating smaller portions, walking more, avoiding the elevator and drinking water before I eat so I’m not as hungry. I like your calculator as I’ve had similar questions in the past about what the right range is; however I have issues with the BMI. In my case, it’s a joke. It says a normal weight for me is 156 which is laughable if you saw me. I think it can give a general guideline, but can be inaccurate for a particular body type by quite a bit. @Cameron Most definitely. There are examples (especially with body builders) where the BMI category is obese but they’re clearly not. I see the BMI as an arrow in the quiver of tools to assess your health, and for some body types it’s not as effective.